Zone-Reflex: Interview with Jarmo Mäkelä, the FQXI winner. Jarmo Mäkelä from Vaasa University of Applied Sciences in Vaasa, Finland, for his essay "Is Reality Digital or Analog" recording a late-night conversation with Isaac Newton. In his essay, Jarmo reports that Newton decidedly told him "Digital, of course". In Vasabladet today is an article about the FQXI-winner, Jarmo Mäkelä, after a hint from me. 'Physicistwinner likes blackholes' is the title. A scanned picture from the newspaper. 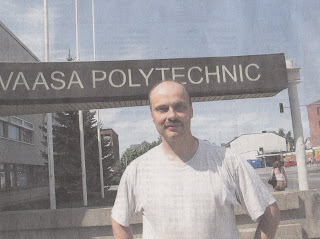 He works as a teacher, sinse 10 years, in math and physics at Vaasa Technical Highschool educating engineers (information and data). He says he enjoys his work. Most of the students comes from abroad, and the teaching language is english. 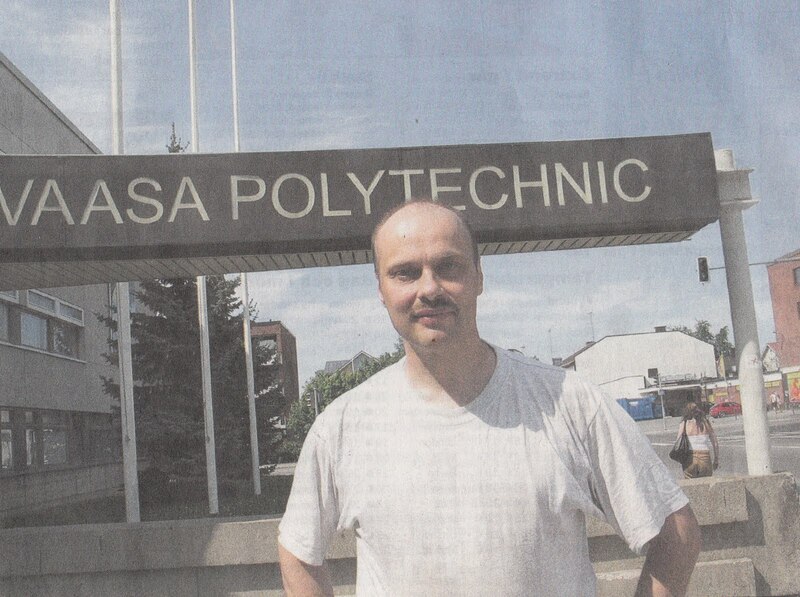 His research is mainly theoretic, as a hobby. He looks at gravitation and blackholes. This prize has no practical influence for his future, but is seen mostly in his CV. Jarmo is 47 years old, from Seinäjoki (about 50 km's from my work), did his thesis at Jyväskylä University. He has a wife and two kids. Interests: physical exercise, skiing, classic music and history. We point out that certain equations which, in a very recent paper written by E. Verlinde, are postulated as a starting point for a thermodynamical derivation of classical gravity, are actually consequences of a specific microscopic model of spacetime, which has been published earlier. On arxive he has 24 publications. Alone or with collaborators, many published in journals. If it pleases the court, so to speak, I too have a series of hypothesis that have to do with the vacuum energy behavior of Jarmo Makela's simply-connected quantized space-time models, but I don't go around shitting up the boards with Lubos Motl-style ex-string theorist borderline crankiness, mostly because no one asked or cares much around here about the Verlinde Hypothesis.